Do you rememberWorzel Gummidge*? He was a big fan of cake and tea and I seem to remember that if formed quite an integral part of each episode. I always found the head swapping that went on a bit freaky and his nose a little too warty but would gladly have put up with all that for a slice of the delicious fruitcake he always seemed to have! There were four cakes which dominated my childhood, a particularly delicious caraway seed cake, a chocolate cake with chocolate icing, lovely rich Christmas cake (all home made by Maggie) and shop bought battenburg cake, eaten at my grandma's house. And whatever Worzel was eating on a Sunday afternoon. Preheat the oven to 180C/Gas 4. Grease and baseline a 2lb loaf tin (ingredients may have gone metric but cake tins stay firmly imperial!). Sift the flour and spice into a large mixing bowl. Melt the butter and sugar in a pan. Peel and mash the bananas and then stir into the butter/ sugar mixture. Mix into the flour with the eggs, walnuts and prunes. You should have a slushy looking mixture with a lovely treacly, banana smell. Pour into the cake tin. Bake in the oven for about 1 and 1/4 hours but possibly a bit longer, until a skewer or fork comes out clean. The length of baking depends on how sloppy the bananas became when you mashed them. The riper the banana the better the taste but the slower the bake if you see what I mean. Cool a little then turn out and place on a wire rack to cool completely (if you have the willpower and if you do can you send me some please, thank you). 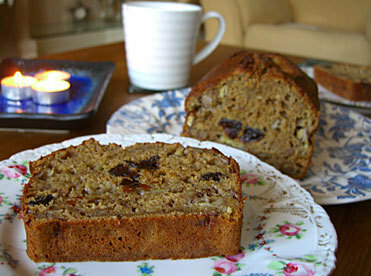 Serve in generous slices with tea, candles and the rain lashing against the window.